Underground portion of SCP-2952 is not visible. Special Containment Procedures: Urban and suburban sections of SCP-2952 should be camouflaged appropriately according to their surrounding environment, or built directly into the walls or foundation of nearby buildings. Underwater sections of SCP-2952 are to be disguised as internet cables. Sections of SCP-2952 in rural or undeveloped areas are to be buried underground. As of 1/5/17, instances of SCP-2952-1 are to be exposed to allow travelers using SCP-2952 to depart and board. SCP-2952-1 instances are to be remotely monitored so that civilians who encounter SCP-2952 can be detained and amnesticized. If an SCP-2952-1 instance is still in the process of being uncovered and set up for monitoring, a small meal of fruits, milk, nuts, wildflowers, and honey is to be left at the instance at each sunrise and sunset. The plate is to be accompanied by a note in Welsh politely apologizing for the inconvenience and providing a date for when the instance will be opened for transit. Though SCP-2952 does not require food or water, regular interaction and play with the head end of SCP-2952 is advisable to maintain emotional health, and is beneficial to onsite morale. 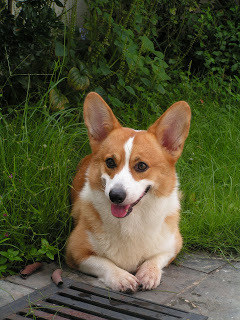 Description: SCP-2952 is a male Pembroke Welsh Corgi measuring over 30,000 kilometers in length. The head and front legs of SCP-2952 are located in Portland, Oregon, while the hindquarters are located in a rural area of Japan's Kariwa District, weaving through the Americas, Europe, and much of Asia in between. SCP-2952 does not appear to age, nor does it require food or water. SCP-2952 will not move more than 5 meters from its original position, even if threatened or offered a reward. SCP-2952 will quickly regenerate from all damage done to it. One end will respond to stimuli from the other without the delay that would be expected due to its length. At certain areas along SCP-2952's length, small openings will form along its sides at regularly scheduled intervals - see Schedule-SCP-2952-1 for a full timetable. These locations are designated instances of SCP-2952-1. There are 324 known instances of SCP-2952-1: some are located in major cities, others in suburban or rural areas. The formation of these holes does not seem to harm or adversely affect SCP-2952. When these openings appear, humanoid beings will exit SCP-2952. These entities, designated SCP-2952-2, are on average 3 centimeters high and cannot be viewed directly - they must be photographed or filmed, though physical evidence of their presence such as shadows or footprints can be observed. After the first group exits, a different group of SCP-2952-2 will appear and enter into the same opening. The opening will then seal until the next scheduled event. The same instance of SCP-2952-2 can be seen entering at one SCP-2952-1 location and departing at another. Openings on the dextrous side of SCP-2952 take passengers west, while those on the sinistrous side take passengers east. The average documented speed of SCP-2952 appears to be 120 kilometers per hour, not accounting for stops at SCP-2952-1 instances. The burying of many of the SCP-2952-1 instances stopped SCP-2952-2 from entering or exiting SCP-2952. Three days after all SCP-2952-1 instances were buried, Project Director Stevens disappeared from his apartment, with an adult European mole left in his place. Over the next three weeks, 17 of the construction workers responsible for burying SCP-2952-1 instances woke to find the walls of their houses had been replaced by a mixture of poison ivy and deathcap mushrooms. After two months, Researcher Mills, who had been in charge of testing the regenerative properties of SCP-2952, woke up with poisonous nightshade berries in his mouth, and stakes of hawthorn driven through his hands and feet. The anomalous events were theorized to be the work of the SCP-2952-2 population. In response, a plan to appease SCP-2952-2 was devised using information collated from relevant myths, leading to the current protocol for unburying and monitoring instances of SCP-2952-1 - implemented December 9th, 2016. Two weeks later, the mole disappeared from its containment area and was replaced with Director Stevens, and the poison ivy and mushrooms disappeared from the homes of the construction workers.1 Security footage showed that during the retrieval and detaining of civilians who saw SCP-2952, there were instances of SCP-2952-2 following the Foundation agents and observing their actions closely. On January 5th, 2017, SCP-2952 became visually imperceptible to all humans not under the Foundation's employ, in an identical manner to that of SCP-2952-2. In addition, instances of SCP-2952-2 are now visible to Foundation employees, though not to civilians. As such, SCP-2952 has now been reclassified as Safe. Thank you for your prompt response to commuter complaints and wonderful customer service. As such, we have granted all members of your organization complimentary transportation on our C.O.R.G.I. system. Please send a sparrow to the Council of the Sidhe office nearest you if you have further questions. Agent Davies' ride on SCP-2952 can be found under Exploration Log SCP-2952 Alpha. Opening Information: Agent Davies entered SCP-2952 at the closest SCP-2952-1 to the head, and was directed to depart at the next SCP-2952-1 instances, where a transport team was waiting for her. All material inside SCP-2952 was written in Welsh, and SCP-2952-2 instances also spoke only Welsh. Agent Elizabeth Davies was selected for the mission in part due to her fluency in Welsh. Log begins at 10:28. Agent Davies: What on earth - okay. Shrinkage seems proportional? Well, let's hope it's proportional, for my sake. (Agent Davies chuckles.) None of the typical detrimental side effects you see with other SCPs that cause shrinkage. And… noting that end height appears to be 3.2 centimeters tall. Control, can you still hear me? Mission Control: We can hear you perfectly, Agent. Agent Davies: All right then. Tech isn't affected by the shift, either. Good to know. Doors should open at 10:35, yes? Mission Control: You are clear to engage in conversation if needed, Agent Davies. Instance 2-A: Hope this thing isn't late again. I tried to make it to the glade in time for midnight at the solstice, missed it by six minutes. All the ingredients for A Harvest's Bane incantation - gone to seed. Agent Davies: Do you know why it's been late? Voice: Now departing from Three Portlands.4 Next stop, West Coast Rainforest. (Agent Davies observes her surroundings. Posted on the upper walls are advertisements for an organic oakmoss tincture, a religious organization practicing a variant of Paganism, a horror movie featuring SCP-2323 entitled "STRIKE OF THE SHRIKE!" and the premiere of a new children's cartoon featuring SCP-2952 called "The Global Adventures of the Great Grady!" Also visible are various forms of graffiti - including multiple messages such as "BROWNIES SUK, GO BACK TO YOUR GLENS," and an image resembling SCP-2547. An instance of SCP-2952-2 further down the car begins playing "Lady Greensleeves" on a flute loudly and off key). Unknown: Shut the hell up, will you!? Instance 2-B: Excuse me dear, would you mind signing this petition? It's attempting to revoke the new law saying that mice are no longer allowed on board. So unfair! Just a signature, dear, that's all I need - not even a true name. Agent Davies: Er… Apologies, Miss, but I'm not a citizen. Instance 2-B: I see. Very well. Would you mind if I sit? Agent Davies: Not at all. Voice: Now approaching West Coast Rainforest. 1. Researcher Mills' wounds were not healed - it is theorized that this was retaliation by instances of SCP-2952-2 for injuring SCP-2952 in the course of studying its abilities. 2. Referred to as Instance 2-A in the log for brevity. 3. Subsequent scans revealed the presence of two moderately sized kidney stones near the New Delhi SCP-2952-1 instance. The Foundation is currently halting service at that stop for a week to allow for surgery and recovery. 4. There is no instance of SCP-2952-1 located in Three Portlands, but the stop where Agent Davies boarded is only 5 km away from an entrance to Three Portlands.